Sol grew up in Baltimore, enlisted in the Army in 1941, participated in the Normandy D-Day invasion, fought in the Battle of the Bulge, and helped to liberate the Buchenwald concentration camp with Gen. George S. Patton Jr.’s 3rd Army. He received the Bronze Star for valor, Purple Heart, Legion of Merit, Combat Infantry Badge with two battle stars, for Normandy and the Battle of the Bulge, and in 2013 was awarded the Legion d’Honneur by the French government. He returned to civilian life, earned a General Educational Development certificate, purchased a bar and then married Jean Turk (an activist involved in civil rights, anti-war protests and women’s rights movements), and then entered the life insurance business, ultimately owning and operating the Lincoln National Insurance Company in Lutherville. According to Rasmussen’s article, in the 50s, Sol joined Israeli Defense Forces, working specifically to get Jews out of the Soviet Union, until the early 80s, after which he went to Ethiopia to assist the Ethiopian Jewish community. Sol was the founder of the Black Jewish Forum of Baltimore, served as president of the Baltimore Jewish Council and founded its speakers’ bureau. He chaired the Soviet Jewry Committee for the National Conference for Soviet Jewry as well as the National Conference of Ethiopian Jewry. WOW! Impressive. What a fascinating man. So, why are we discussing Sol in The Equiery? If you keep reading down to almost the very end of Rasmussen’s article, you’ll find it: “Mr. Goldstein enjoyed keeping and riding Tennessee walking horses.” This is how we knew Sol. Not surprisingly, “enjoy keeping and riding…horses” is a vast understatement when it comes to Sol. Like everything else in his life, when Sol got involved, he got involved. With the encouragement of fellow gaited-horse owner Sandy McCann, Sol became active in trails issues, eventually joining the Maryland Horse Council in the early 90s as an individual member. His passion and natural leadership abilities quickly catapulted him to a Director-at-Large for Individual Members spot, then to vice president, and then to president (1999 to 2001). During his tenure, he dramatically increased MHC’s individual memberships and he also was a driving force in getting all the trail organizations within MHC to work together for the Trails & Greenways Committee. He singlehandedly forged a relationship between MHC and the Maryland Department of Natural Resources, and actively networked MHC into the Maryland State Highway Administration in order to access federal funds known as TEA-21 (originally ISTEA) for local bridle trail projects. On a personal level, I am grateful that Sol Goldstein graced my life. Sol took the time to give this then young businesswoman sound advice, often meeting me for breakfast at Lenny’s Deli in Owings Mills. Ostensibly, we would meet to review MHC agendas and objectives, but inevitably we would end up discussing business, and he would offer me invaluable guidance from his 40 years growing and managing his life insurance company. Years later, he showed me one of his pet projects, the restoration of the Ashland Mill in Dickeyville, and he was as passionate about this as he was every other aspect of his life, from his family to his community and everything in between. A courageous soldier and human, a successful businessman, a loving husband, a proud father, a big thinker, a problem solver, an avid trail rider, an enthusiastic friend, a wise mentor, and a driving force within every community he touched, Sol Goldstein was all of these. But Sol was also, quite simply, a kind and generous man. 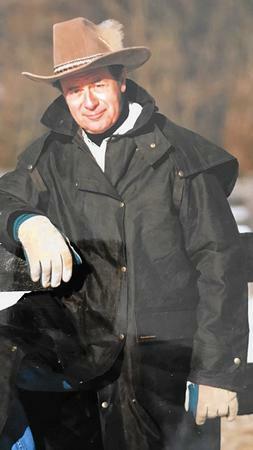 It was a privilege to have had him touch our lives, and to touch our equestrian world.